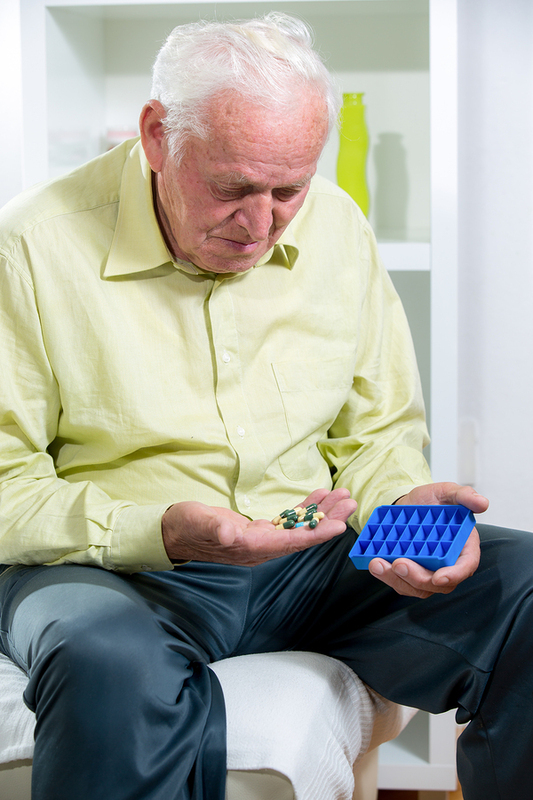 How many medications does your elderly loved one take every week? According to Merck Manual's "Aging and Drugs", in the group of people who are age 65 years or older, 90 percent take at least 1 drug per week, more than 40 percent take at least 5 different drugs per week, and 12 percent take 10 or more drugs per week. The number of medications taken increases the likelihood of potentially dangerous drug interactions. Elderly patients may be more susceptible to adverse drug reactions because of the way medications are absorbed. For instance, drugs that dissolve in water may reach higher concentrations in the elderly, because the amount of water in the body decreases as one ages. Likewise, drugs typically absorbed in fatty tissues may reach higher concentrations in the elderly, because as people age, the amount of fat tissue in their bodies decreases. The body breaks down drugs and excretes them through the kidneys and metabolizes them through the liver. This process slows considerably as people age, making it more likely that hazard levels of drugs can build up in an elderly patient's body. Common side effects of some medications are intensified among seniors. For instance, older adults often are more likely to become confused, dizzy, or light-headed when taking certain drugs than are their younger counterparts.